Like many towns in Colorado, the box canyon village of Telluride has its late 19th-century roots in mining. There was indeed “gold in them hills,” though interestingly enough, never actually the mineral for which the town was named. These days, however, Telluride isn’t known for mining as much as it is for art, film, skiing, festivals, food and breathtaking scenery with endless outdoor adventures. My family may be from East Texas, but we somehow have Colorado in our DNA. Generation after generation is drawn to the mountains, colors, lakes, rivers and streams of Colorful Colorado. I don’t know how my grandparents first stumbled upon the small and relatively remote town of Telluride, but I know that for more than a half-century, our family has been drawn to this Southwest Colorado destination that is 45-minutes from the nearest town with a stoplight. For our 10th anniversary, Josh and I decided on a late summer trip to Telluride. While we only had a weekend to work with, we made the absolute most of every single minute we had at our disposal in the San Juan Mountains. To encourage you to visit this historic and vibrant town, here are 10 tips for visiting Telluride. I’ve mentioned that Telluride is remote, but allow me to emphasize just how remote it can be. If you flew into Denver to visit Telluride, you are looking at a 13-hour round-trip drive from Denver to Telluride. That may be fun on a road trip, but probably not the best plan for a weekend visit like we made. A better idea is to use your airline miles to fly into Montrose Regional Airport (MTJ), about a 90-minute drive from Telluride. We took a United Airlines nonstop flight from Houston (IAH), but MTJ is also served by American, Delta and Allegiant. However, the newest, and perhaps best, way to get to Telluride is to fly United’s new partner Boutique Air from Denver directly into Telluride Regional Airport (TEX), about 10-minutes from town. Inside the Pilatus PC-12. Photo courtesy of Boutique Air. However, the reality is that TEX is not the world easiest’s airport for landings and takeoffs, and flights to TEX are diverted to MTJ with some regularity, so just be prepared for that reality when deciding the best route to get your family to Telluride. Telluride Tex Airport. 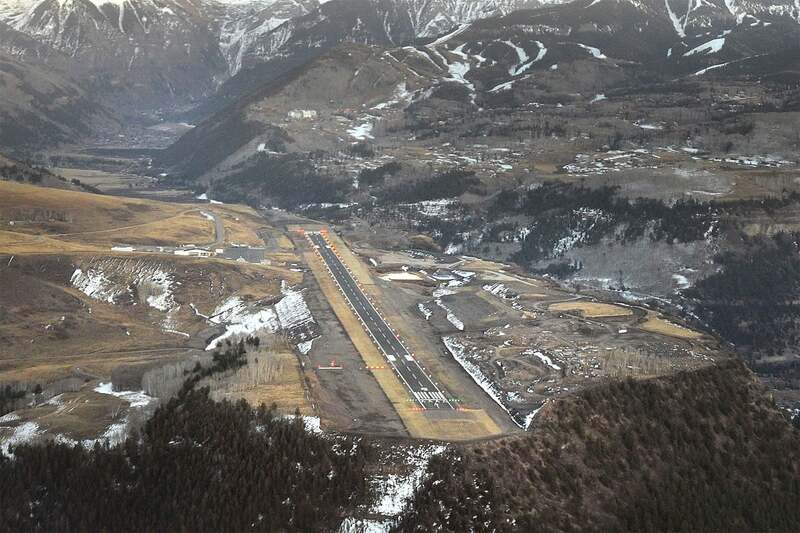 Photo courtesy of Telluride Tex Airport. A very rare offering available in Telluride is a free gondola ride over the San Sophia Ridge and into the Mountain Village. Many mountains have gondolas, but most of them charge you to ride up and down, even if you aren’t skiing or biking. Telluride lets anyone (human or canine) ride up and down to their heart’s content. The 13-minute ride provides breathtaking views without even leaving the gondola, but I recommend you exit at the first stop, San Sophia station, and take a good look around. From the 10,540-foot-high Station San Sophia, you can hike around the mountain (for free), ride your bike down or just take a seat and enjoy the views. When you get back on the gondola, you can head down the other side to Mountain Village. Mountain Village is a modern-day ski mountain base with hotels, shops, restaurants and places to let the kids run and play. 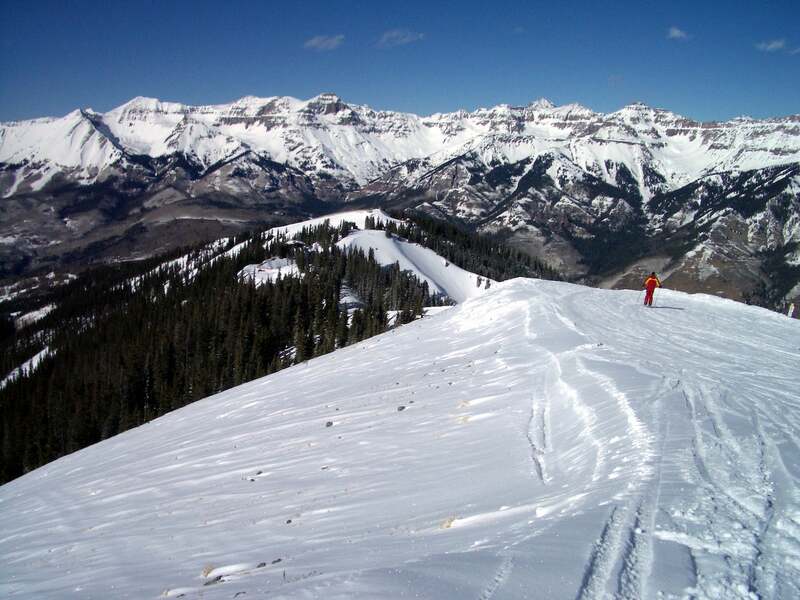 In the winter, this is where you will also find the Telluride ski school, nursery and more. Mountain Village is great to explore and prep to ski the mountain, but Telluride’s historic district is where it’s at. If you aren’t sure where to start, you could drop in Telluride’s Historical Museum, located on West Gregory Avenue. But if you want to hop right into the living history, head to Colorado Avenue that goes right through the heart of Telluride. While you are exploring Colorado Avenue, pop into the New Sheridan Hotel. This hotel is anything but new as it first opened in 1891, and then rebuilt in 1895 after a fire. Even if you don’t stay at the New Sheridan, you can head to their roof for a drink or settle in for a meal at Chop House or even at their historic bar that also serves $5 Jack Daniel’s. It is here that we enjoyed a leisurely brunch and an amazing Rocky Mountain trout salad, topped with a poached egg while thinking about all of the history that had taken place from the seats at the long wooden bar. If you keep walking down Colorado Avenue, you will eventually get to the planned site of the Hotel Ajax, a Luxury Collection hotel. However, I was very sad to see that the construction site is still just dirt. Building in historic Telluride is a far from simple task, but this planned hotel would have brought a points option to Colorado Avenue, but years into the project, there is still just some fenced-in historic dirt. Bridal Veil Falls is synonymous with Telluride, and is a can’t miss natural wonder located toward the east end of the box canyon. At 365-feet, this is Colorado’s highest free-falling waterfall, and though I have to say that the flow from the waterfall on our most recent trip wasn’t as amazing as it has been in the past, it is still a must-visit spot. You can hike under 2 miles to reach the top or drive part of the way up. Bridal Veil Falls. Photo by Shawn Stilwell/Flickr. 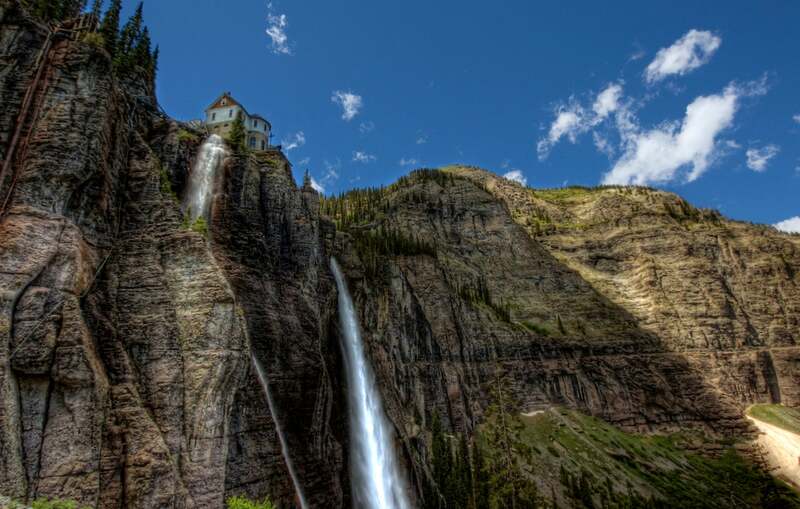 Whether or not you decide to hike up to Bridal Veil Falls, there are plenty of hiking trails all around Telluride in an array of lengths and difficulty levels. On our most recent trip we hiked from town at South Pine Street up Bear Creek and that’s labeled as an easy-moderate hike. Now take into account that we are from sea-level and Telluride is at 8,700 feet before you start climbing the 1,000+ feet on that hike, but I would not call this 2.5-miles easy. We were totally exhausted by the time we reached the top, but it was 100 percent worth the effort. While we didn’t find Little Hawaii (a well-hidden trail off Bear Creek Falls), we did enjoy the balanced rocks of those who came before us. Once you get to these man-made wonders, you are getting close to the top, so keep on climbing! While this hike was not easy for us, we were very entertained by a mom with a toddler strapped to her back who was literally running up and down the trail. Be sure to brush up on your bear safety before heading up as you are in bear country on these trails, though it is a pretty well-traveled path. Assuming you have a car, plan to make the 20-minute drive up to Alta Lakes at some point during your time in Telluride. To get there, head 5 miles south on Highway 145 and then turn east on Alta Lakes Road. From there you have about 3 miles to go along a very narrow and winding mountain road (so be careful). The destination is worth the journey as Alta Lakes is stunning beyond words. In fact, I’ll stop talking and let the pictures speak for themselves. There are port-a-potties available at Alta Lakes near where folks camp, but there are no stores, so be sure and pack a lunch to picnic in one of our most favorite spots on earth. If you want to explore the Telluride area on horseback, one option is to Ride with Roudy on a one-hour, two-hour or private ride. I rode with Roudy back in college, and what I remember the most about the ride was getting yelled at on horseback by Roudy himself. It was part of the experience in the same vein as the “no soup for you” character in Seinfeld. The website says that Roudy is in semi-retirement, but there were Ride with Roudy signs all over Telluride on our recent visit, so I’d venture to say that things are alive and well in Norwood, about 30-miles from downtown Telluride. 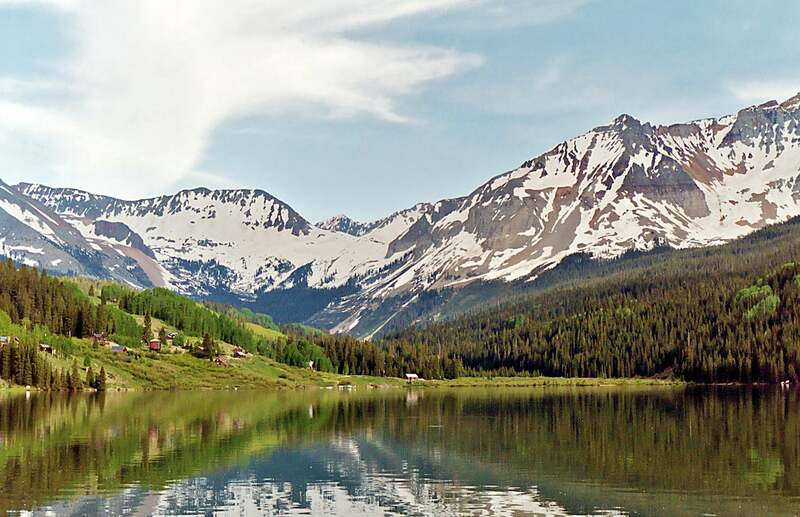 If you want to do more than just look at pretty water from the shore, get in touch with a company such as Telluride Outside who rents out stand-up paddle-boards, offers guided tours and much, much more. They will get you onto Trout Lake and beyond from the comfort of your paddle-board instead of being in the cold mountain water. Trout Lake. Photo by Steven Martin/Flickr. Between the mining boom and the ski-town transformation, Telluride was a hippie-enclave. In many ways, it still sort of is. These may be “hippies with money,” but the creative, free-spirited, artistically inclined are drawn to Telluride — and some never leave. This means there is a local art scene in the middle of the mountains. More accurately, there is an international art scene in the middle of the mountains, but we’ll get to that in a minute. First, know that there are 19 galleries in Telluride that host receptions from 5–8pm on the first Thursday of most months, so target one of those dates to take in lots of art at once. If you like your art to move and talk, then you’ve undoubtedly heard of the Telluride Film Festival. The Telluride Film Festival has taken place since the 1970s and it now happens each Labor Day weekend. Locals, celebrities and film buffs from all over descend on Telluride for this festival each year. Uniquely, the festival keeps the specific films a secret until opening day. This festival was happening during our most recent visit and is what almost caused us to have to sleep in a car as lodging is extremely scarce in Telluride during festival weekends. In the end, we lucked into staying at Telluride’s newest “hotel,” which is actually a boutique bed-and-breakfast called the Dunton Town House. This luck was thanks to a production company deciding against attending the festival at the last minute. During the weekend, we walked past a number of major film stars such as Emma Stone (saw her on the gondola), Casey Affleck (he was on West Galena) and a few other suspected sightings. I’ve been saving some of the best for last as Telluride’s food scene is a million steps above what you might anticipate for a town of just over 2,000 residents. I’m sure everyone has their favorites, but in addition to the already mentioned options at the New Sheridan Hotel, I encourage you to visit both 221 South Oak and Siam. 221 South Oak is, as you might have guessed, located at 221 South Oak (right across from Dunton House). It was dark and raining during our visit to 221 South Oak, so I didn’t grab any photos, but I did walk away with memories of a fresh, local meal set in an historic home. There is both a meat-lovers and vegetarian menu with a healthy selection of vegan options and a willingness to meet a variety of dietary needs and restrictions. I recommend making advance reservations for 221 South Oak and going ready to eat your way around the menu. Another dining gem in Telluride is Siam, which does not accept reservations, though you can call after 4pm and get placed on a same-day waiting list. Siam serves traditional and contemporary Thai food, along with Asian-fusion menu selections. Whatever they want to call their cuisine, most importantly, know that Siam is absolutely out-of-this-world good. I would have eaten here for every single meal if Josh would have gone along with the idea. In fact, I did try to come back for lunch after our first dinner, but sadly they are only open at dinner. However, there is a sister restaurant, Siam’s Talay Grille in Mountain Village that is open for breakfast and dinner, so that may be a pathway to even more Asian food perfection. We didn’t make it up there to Siam’s Talay Grille, but if it is even half as good as Siam, it would be worth a ride on the gondola. Another favorite among locals and visitors is Taco del Gnar. Taco del Gnar isn’t unique to Telluride as you can also find these “Gnarly Tacos” in Ridgeway and Salida, but that doesn’t diminish the casual yet cool way to fill your stomach in Telluride. Telluride is now Epic, as in it is in the Epic Pass family of more than 65 ski resorts around the world. The full Epic Pass now gives you seven included days of skiing at Telluride — and 50 percent off days beyond your included seven. You can also an Epic four- or seven-day pass to ski at Telluride. While I hope to rectify this massive oversight in the near term, I have yet to actually ski at Telluride. However, my understanding is that it is a very balanced ski resort that truly offers something for all levels of skiers. This year, Telluride anticipates opening the mountain the day before Thanksgiving and running through the first Sunday in April (subject to Mother Nature, of course). Telluride Mountain in winter. Photo by gmiphone/Flickr. If you have a young family, know that Telluride is unique in that 2.5-year-olds can go to ski school. The typical cut-off is 3, but our 2.5-year-old would have probably loved their program last year had I know it existed. Their Cubs program for children 2.5 to 4 years old combines indoors with the outdoors. Instead of keeping them in a “day care” all day (or out on the slopes all day), they go outside for one hour on skis with a personal instructor. Also know that children 5 and under ski free in Telluride and tickets for those who are 6 to 12 are just $50 to $69 for a one-day ticket, which is much less painful than child’s prices at resorts such as Vail that can be almost double that amount. You could spend a week or more in Telluride but even if you only have a weekend, you can experience a great deal since so many things are within a short walking, hiking or driving distance. This magical spot of Southwest Colorado is worth the journey. Now that you know 10 of my favorite things to do in Telluride, I’d love to hear about your favorites!